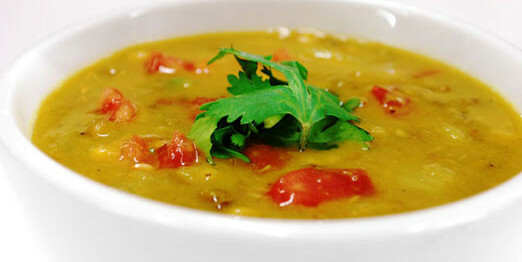 An inexpensive, easy-to-make and delicious soup. First examine the dry peas and remove any objects or small stones that you find. Rinse them with warm water 4 times. Place the peas in a pot with water and let them boil. Let simmer until the beans or lentils are very soft (ca 30 minutes). In a small frying pan, fry the garlic in oil until ligh golden. Then add the coriander powder and cayenne pepper with the garlic and fry it for 10 seconds. Then add it to the peas with the rest of the ingredients. Let simmer for another 5 minutes. Remove it from heat and serve it. Add squeezed lemon to taste and serve hot with naan.